Compared to traditional data sources, crowdsourced geotagged photographs provide an otherwise unavailable perspective on the connections between humans and nature and facilitate understanding of how people perceive landscapes and experience cultural ecosystem services. Landscape photographs communicate about the significance of human relationships with and within landscapes, they account for historical, cultural and social ways of seeing the world, about human practices and the processes of nature, and about physical and anthropogenic features, thus offering a basis for an integrated understanding of landscapes and the values that they provide to humans. For these reasons, elicitation of ecosystem services provided by landscapes through landscape photographs has developed in the last decades as a visual method for understanding rural landscapes. Despite all the recent advances in this emerging methodological approach, some challenges remained to be explored. A team of researchers from the University of Copenhagen (Denmark), the University Pablo de Olavide (Spain), the Leuphana University (Germany), the University of Turku (Finland) and the University of Hohenheim (Germany) gathered together around these challenges and five of the study landscapes of HERCULES project in Estonia, Greece, Spain, Sweden and Switzerland. As a result, a paper has been recently published in the journal Ecological Indicators, where some of these challenges are addressed by developing and applying a method to: (1) identify the most frequent cultural ecosystem services that are represented by landscape photographs and the associated landscape features; (2) specifically explore how landscape heterogeneity is associated with cultural ecosystem services diversity; (3) identify bundles of cultural ecosystem services mediated by landscape features that emerge from diverse landscape perceptions; assess the methodological approach by (4) analysing differences between two social media (Flickr and Panoramio); and by (5) comparing the land cover shown in the analysed photographs with the CORINE land cover across the study landscapes. A content analysis of 1.404 photos uploaded in Flickr and Panoramio platforms that can represent cultural ecosystem services was performed. 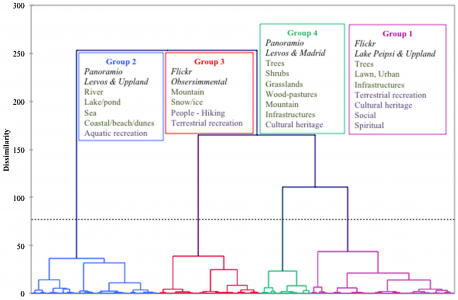 Four bundles of landscapes features and cultural ecosystem services showed the relation of recreation with mountain areas (terrestrial recreation) and with water bodies (aquatic recreation). Cultural heritage, social and spiritual values were particularly attached to landscapes with woodpastures and grasslands, as well as urban features and infrastructures, i.e. to more anthropogenic landscapes. A positive though weak relationship was found between landscape diversity and cultural ecosystem services diversity. Particularly wood-pastures and shrubs were more frequently portrayed in all study sites in comparison with their actual land cover. The results can be of interest for the elicitation and comparison of landscape values across European cultural landscapes. However, they also provide methodological insights in the face of an increasing trend in the use of geotagged photos, which on one hand provide free and easily retrievable big data, but on the other hand are biased by being created and used by particular groups of social actors in specific geographic areas. Pending critical questions to be answered in future research are: what landscapes, landscape features and ecosystem services still remain socially invisible in social media, to whom and why? The study can be found at: http://dx.doi.org/10.1016/j.ecolind.2017.02.009.